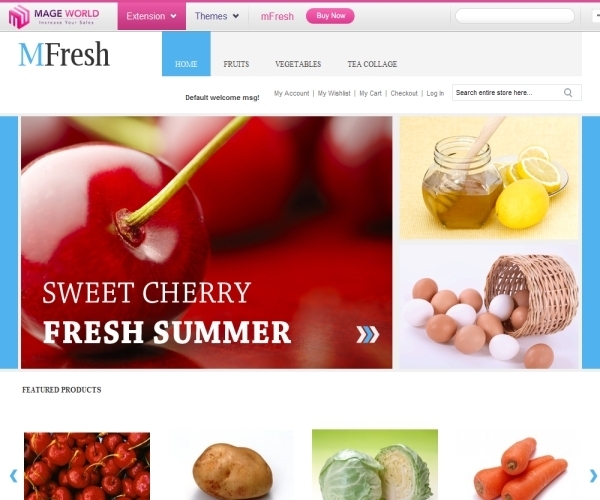 mFresh is a premium Magento theme for an online fresh, grocery and organic food sites. It comes with included image sliders, support for multiple product images and a magnification slider which allows users to easily browse through your featured products. It’s built with a SEO compliant design scheme and is optimized for a faster page loading which ensures a user-friendly experience for your customers. The theme package comes with included PSD files for easy customization. Its built to be compatible with major browsers and confirms to latest HTML and CSS design standards. The homepage comes in a clean layout with an image slider aligned with a featured banner space. You can use them to showcase your latest products, deals, discounts and promotions. A second slider in the content area can be used for your featured product categories. The theme also has an opt-in box for newsletter subscription and supports custom extensions in the footer. Primary navigation is by a multi-level header menu that can be used for your product categories. An additional top menu can be used for your account and shopping cart management links. The theme also supports article quicklinks in the footer block and also includes a keyword search box in the header. Internal pages have additional category links in the sidebar which can be customized as per your requirement. This premium theme can also be used for organic food stores where you would want multiple categories of products to be displayed along with associated images. Users c an also sort internal category listing pages by custom attributes and can choose the number of listings per page and the view format. Extensive banner spaces help you easily showcase promotional and Ad banners. Individual product pages come with support for multiple images along with a magnification slider that allows you to select the magnification range of the featured images. Also included is a “Related Products” extension along with a provision for users to compare multiple products. A “Recently viewed Product” extension would automatically populate all recent products that the user has browsed in that session. Registered users can write reviews, submit product tags and can also email the page link to a friend. The theme also allows users to create and manage a wishlist of products. The theme also comes with a Contact Us page with a built-in message form from where users can send a direct message. The mFresh theme is priced at $49 . You would need to purchase the banner and testimonial extensions separately from their website. A version of the theme with removable footer links would cost you $25.00 more. The Developers version is priced at an additional $89.00.